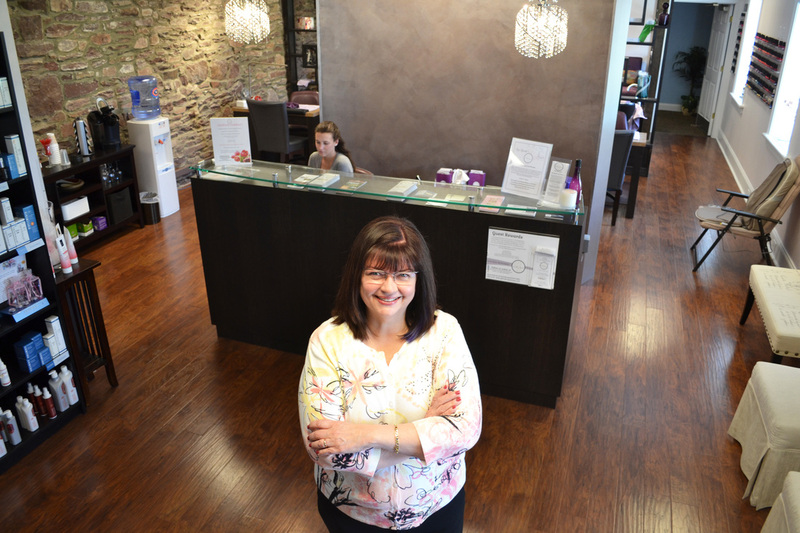 Location: 730 Chambersburg Road, Gettysburg, Pa.
What is unique about your business: We are the area’s only full service salon and spa. We do hairstyling, coloring and cutting, manicures, pedicures, waxing, facials, and massage. Our spa has two tranquility areas, two facial rooms and three massage rooms that can accommodate single and couples massage. We have the ability to accommodate large groups for wedding parties that want hair and makeup and manicures and pedicures, princess parties, ladies days packages, and couples packages. We can also cater to the person who just wants to get away and have some alone time. We were first located in a historical 1863 building in downtown Gettysburg. We moved just 1 year ago, March 2014, into another historical property; the former Gettysburg Country Club building which is located on the property of the historical Katalysine Springs Hotel. Why did you choose to start a business in Adams County: My story is that my business chose me. I moved to Adams County through marriage and ended up making it my home. I started my business with just myself and as my business grew, I learned how tourism can help. It is mainly in the last 4-5 years that I have seen major growth in my business and much of that is related to tourism. We are still in the growth stage and have new experiences to launch in the near future. How do you feel your business is affected by tourism: My business is affected by tourism in a very positive way. We have created very strong bonds with many of the hotels, bed and breakfasts, and restaurants. They are looking to give their guests a unique experience and we are able to help them, by giving their guests a chance to relax and to have a positive and relaxing experience while here. It is very important to get to know your neighbors in business. We can all help each other grow. Favorite visitor experience: Back in early winter, we had a call from my cousin, Roger, who was wanting to bring his sister, Lori, in for a spa day for her birthday. He and his wife, Gail, are from Florida and Lori is from Western Pennsylvania. We got everything coordinated and got her appointments scheduled. On the day of her services, they were leaving Western Pennsylvania at about 8:30 that morning. They put a blindfold on her before they left and wouldn't let her see where they were going because they didn't want her to know, because she would recognize the route. They stopped for lunch and let her take off the blind fold so she could eat. After eating they put the blindfold back on her and drove to our parking lot, where they guided her up the sidewalk and in through the front door. I was helping them but I couldn't say a word because my voice would have given it away. Once she was inside, they took her blindfold off. She was so excited to be in Gettysburg and to be at Gettysburg Day Spa. They all had a wonderful day of services. Later that evening, we surprised her again with dinner at One Lincoln. It was a wonderful day.